Grow lights are very new to the scene but they are also becoming more popular among the masses because of their efficiency and are very easy to use. These lights are useful at all growth stages of a plant and can generate more light per wattage as compared to the HID or fluorescent lighting. They also run cooler which reduces the power costs and any danger of producing flames in your greenhouse. Some of these grow lights come with little built-in fans, and they don’t need any additional ventilation. There are plenty of choices available on the market when it comes to LED grow lights, but not all of them offer exceptional quality and optimal results. We have developed this guide to provide you with information on how to choose the best LED grow lights in 2018 for your growing room. 2.1 Why you need these LEDs? 3 HID vs LED Grow Lights: Which is Right for You? The LED from TaoTronics is specially designed for indoor growing and is ideal for hydroponic greenhouses. This light bulb is available in two different wattages including 12 watts and 36 watts, and you can also choose from three different colors if you are interested in greenhouse interiors. The product comes with a 12 years warranty, and if you register with the company, then you get an additional six months as well. 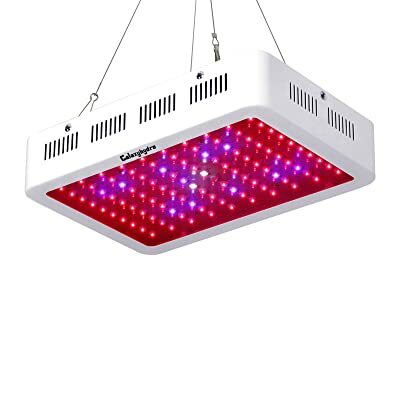 The hydroponic grow light has a total of 12 LEDs in which nine are red, and three are blue. All these lights are very bright and help your plants grow when they are in need of light during rainy weather or overcast skies or in the dark indoors. The bulb doesn’t consume a lot of your power but is very bright and is one of the most energy-efficient growing bulbs available on the market. It has an internal system that lowers the voltage. The exterior of the bulb is made in a true heat-sink fashion, and it doesn’t heat up. You can keep it turned on for 17 hours per day and it will not increase the temperature of your greenhouse. Comes with a 12-year warranty, and after registering it, you will get an additional six months as well. Has low power consumption and has ultra-bright light, providing you with high energy efficiency. You can keep it on 17 hours per day, and its exterior won’t heat up and raise your indoor temperature. Has a tiny light range that doesn’t cover much area. Maybe too bright or intense for some delicate plants like aloe, strawberries, peppers, and raspberries. 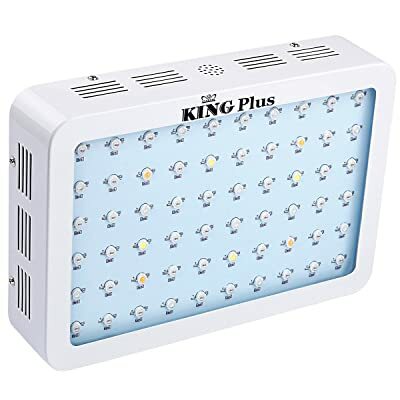 The King Plus LED Light comes with a full spectrum 600W light board, and features ultraviolet and infrared technology. It is best suited for large greenhouses and indoor plant growing areas. It is available in three different wattages including 600W, 100W and 1200W. You can choose one based on your needs and requirements. The new model is upgraded from the previous one, and it is equipped with 10W LEDs which are far brighter in comparison to the 3W and 5W LEDs. The full spectrum light it generates is similar to sunlight and is ideal for the growing stage for most plants. It is also equipped with a couple of high-speed fans as well to keep the exterior cool. The LED features aluminum heat-sinks to keep the system cool. Its energy conservation is far more effective as compared to a 600W MH/HPS bulb because it only consumes 120W. Also, the lamp is covered with a three years warranty. Produces full spectrum light that is very similar to sunlight and helps in the growing stage of the plants when they are not getting enough natural light. The bulb is covered under a 3-year warranty. Comes with a couple of fans to keeps the bulb’s aluminum exterior cool during operation. The two internal fans are not very effective at keeping the light cool, and you need additional ventilation as well. Some of the diodes of this light go out after a short while. The Roleadro equips you with the appropriate product that uses impeccable technology to manufacture high end LED grow lights. It shows up with the 9 bands full spectrum to help plants grow healthy at all stages. In the Roleadro grow light you will find red and blue lamp covers with IR and UV technology. It also features 90 to 120-degree broad angles that can cover large space so that light can reach easily. There is a powerful temperature controlling system in this 300W LED which removes the excessive heat. Rather having a reflector this grow LED light by Roleadro has zener pattern which will not disturb the other LED. In this way, it can sustain a temperature above 73 degrees without melting. This LED full spectrum light is easy to carry anywhere because it weighs about 8 pounds. You may not complain about the noise produced by the 55 dB of sound. Gives off 50,000 hours of continuous light with an elongated lifespan. The wattage is not according to the description mentioned by the brand which can hinder the growth of the plant. The 45W LED light is yet another pick for those who need advanced technology for quick plant growth. The Unifun always tries to come up with the innovative products and the 45w plant growing bulb is the true example. It has added UV and IR in this version of grow light for a different type of indoor emerging plants. The blue light ranges from 460 to 470 nanometer that promotes photosynthesis chemicals including carotenoid and chlorophyll. It also features bands of 4 peaks for the betterment of the environment hence it is eco-friendly. The frequency with which it functions effectively is between 50-60 hertz with a coverage of 1.5 square feet. Anyone can easily install the device. 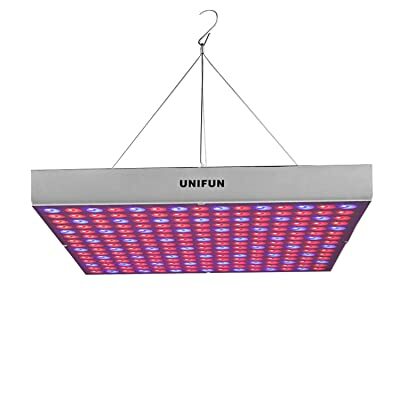 The manual provides complete instructions for assembling the Unifun grow light. For the effective plant growth, this 45W LED uses full spectrum light of infrared rays. The Unifun always ensures the quality of the product it makes, offering a 1-year warranty. The lights of this 45W LED light burns out with excessive use. If you want to sow in larger areas then it might be the better As it can make crop blooming difficult. iPower LED light bulbs are the best option for growing your veg or plants. 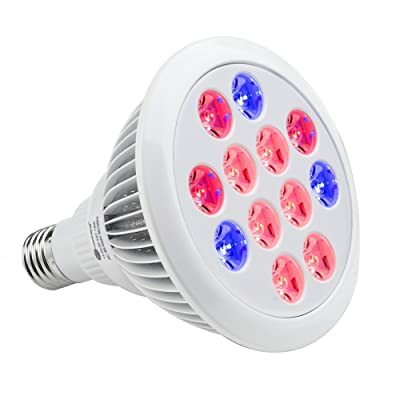 This LED grow bulb has 18 (12 white and 6 red) ultra-bright LEDs. This helps in boosting up the growth of your plants at a rapid rate. This is a definitely low power consuming LED bulb. It is a 12 watt grow bulb with efficient energy for a faster growth. Moreover, with the high luminous efficiency, this grow bulb has a long life. It produces more lumen for less wattage. What’s more, with the minimalistic design, this LED grow bulb takes up much less space. If you have a tight place in your garden, you don’t need to worry about heat build-up. They are great for perking up a houseplant as well as vegetables. The white LEDs are responsible for a balanced and broad spectrum. The red ones trigger the growth of the plants. These bulbs fit into a standard E26 socket easily. With the ip65 rating, this a definitely waterproof grow bulb. It maintains its performance in all weathers. This is very easy to set up grow bulb. The reflector disperses the heat well. The clamp is very strong to hold the weight of the head. An inexpensive LED grow bulb for all lighting needs. The metal is a little cheap. May come loose in a box so it could get damaged. 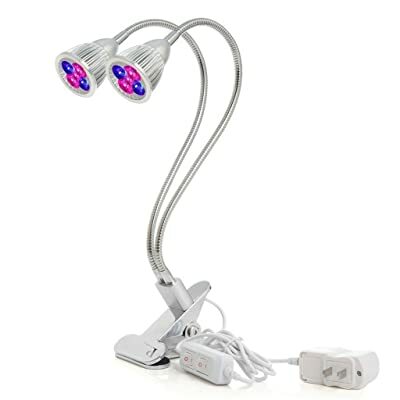 Another grow light is the dual head UV and IR light. This grow light has a composition of 10 LEDs. This includes six red and four blue LEDs emitting an intense wavelength absorbed by plants. This is extremely beneficial for photosynthesis and a plant’s growth. The design of the PPUNSON LED bulb is great. It has a single base with two heads. This helps in achieving 360 degrees coverage of plants. There are double switches for each of them which adds convenience. They are designed with a parallel circuit system. So, you can pick one head to light up at the same time. The height of the arms is about 19 inches with the clamping range of up to 2.75 inches. This allows the flexibility to adjust to the position you want. The clips are made of sturdy metal. The cord length is about 57inches which gives enough free movement. The company offers a 30-day money back guarantee. Further, it has a power of 10 Watts. So, this makes it suitable for your power saving needs. It works up to 5-8 hours a day without getting dull. This is a very sturdy bulb for all your plant’s growing needs. Easy to set up and uses an LED bulb. The coverage of the bulbs when both open is great. This is a great bulb for the price. The switches don’t get hot. Giving an optimal full spectrum, Viparspectra LED is ideal for all indoor plants and vegetables. It is constructed with great research and care. This is a scientifically engineered LED bulb which keeps the balance of the PAR output. Giving a full coverage, this LED grow bulb helps in the process of photosynthesis. It does the work of a 400 watt while consuming only 200 watts. The lifespan of this bulb is about 100,000 hours. With the extremely bright light, it helps with the rapid growth of your plants. 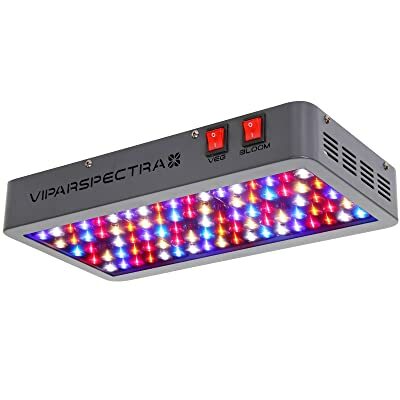 Viparspectra light has an excellent heat dissipation quality because of its aluminum. It works continuously for hours without heating up. This makes it 70% cooler as compared to other grow lights. It has separate options for the vegetable switch and bloom switch. This bulb is a perfect choice for a 2.5×2.5’ vegetation coverage at 24’’. And, it gives 2×2’ flowering coverage at 18’’ perfectly. The bulb comes with a three-year warranty and 30 days satisfaction. It also has a six feet power cord to adjust as you need. The best budget lights for the beginners. The light it emits is very bright. These are very durable lights. Does not get hot and is very easy to set up. Perhaps one of the strongest competitors on the market, the PlatinumLED P300 is a blend of efficiency and versatility. It uses a 93 Watt power input, but can be dialed up by engaging the full 180 Watt power supply with the flip of a switch. What sets the PlatinumLED P300 apart is its whopping 12-band spectral range that allows you to choose between wavelengths from 380nm to 760nm which makes it fit for assisting growth in your plants at all stages of development. Additionally, the dual VEG/FLOWER switch allows you to adjust output according to your requirements. Moreover, the P300 ensures that the maximum amount of light possible is utilized as photosynthetic active radiation. This is achieved by using primary reflectors at 60 degrees combined with secondary reflectors at 90 degrees, which ensure that most of the light is focused on the plants. It offers a coverage area of about 4.5’x 4’ at a height of 18”. Combine that with the innovative aluminum heat sinks which enhance its heat management capabilities, as well as astonishingly quiet cooling fans, and you have a product that is fit for both domestic and professional use. 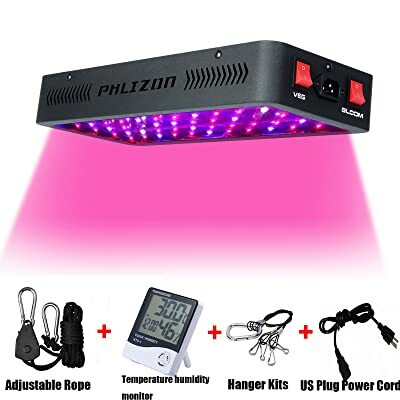 The Phlizon combines 60 10 Watt LED lamps with dual-chips to obtain its power output of 600 Watts, while only using 108 Watts, making it energy efficient. However, because the company takes heat management seriously, it avoids using reflectors in their design which tend to cause heat generation. As a result, the Phlizon only manages to substitute for a 400 W HID. On the plus side, the package does include a thermometer, humidity sensor, and clock. Like the Platinum-LED the Phlizon also has a full range spectrum and combines output from 12 bands across the visible spectrum to provide the radiation to plants. In fact, it also uses Infrared and UV rays. Furthermore, it has a dual-switch feature as well, where the VEG setting can be used during the germination phase, while the other for when the plants start to flower. At 15.7” x 6.7” x 2.3”, it is smaller than most LED grow lights, which does affect the PAR and coverage area of this model. However, it is important to note that at 24 inches of height its PAR value is 260 which is actually ideal for germination in most plants. Das for coverage, depending on the setting, the Phlizon will cover between 2 ‘x 2’ and 3’ x 3’ of crop area. The BESTVA LED is made with the intention to provide high lumen with low for higher yields, and possibly at low heat. It uses a massive configuration of 120 dual-chip LED lamps, while reflectors angled at 120 degrees to encourage the spread of light. Like the other entries on the list, the BESTVA also boasts a full spectral range, obviously rendering it capable of assisting plant growth at all stages as well. But what makes it special is the fact that it combines this spectral range with an enormous 1200 Watt output, which makes it suitable for covering large areas, or catering to a larger number of plants; all the while consuming merely 240 Watts of energy. Even with a size of 15.7”x8.4”x2.4”, the BESTVA grow light will cover an impressive area of 5.7’x5,4’ at 24 inches in height. To add to that, it also comes with a powerful cooling system in the form of a built-in cooling fan, holes in the aluminum panel body and glass to allow for heat loss through convection. This ensures that the light runs at a lower temperature than its counterparts by about 50 to 60 degrees Fahrenheit. Why you need these LEDs? These are capable of generating more light as compared to the HID and fluorescent lighting. Furthermore, these lights also run cooler as compared to the traditional lighting. These lights are highly efficient in energy conservation, and they don’t contribute to increasing the indoor temperature of your greenhouse. Some of them are equipped with internal fans to keep them cool, and you don’t need proper ventilation. When buying an LED grow lamp, you must also understand that the recorded wattage implies that you can replace it with a traditional light. For example, if the recorded wattage of an LED lamp is 300W, then this means that this lamp can replace a 300W conventional light while the original wattage will be around 140W. The LED grow bulbs have small diodes with different wavelengths of colors, and they are instrumental when it comes to energy efficiency. However, there are different kinds of LED grow lights available on the market, and you need to choose only those that offer optimal productivity. Therefore, there are some critical points that you need to consider before buying an LED. All LED lights are not the same, and you need to understand your preferences and requirements as a grower too. LED lights are 100% recyclable, and they are very eco-friendly. Furthermore, they don’t come with any toxic substances or elements such as mercury that is used in the traditional light bulb. These lights are 80% more efficient as compared to conventional sources. LED lamps offer durability and endurance, and it is one of the most significant merits of this lighting option. These lights don’t use much energy and are highly efficient. These lights are capable of lasting more than 50,000 hours which means that you don’t have to do much when it comes to maintenance. These lights are very easy to set up because you only need to set them up and then plug it in to turn on. The installation of the conventional lighting options has more complications when it comes to installation. The LED lights are known to produce less heat as compared to the traditional lighting options because it doesn’t consume much wattage. Less temperature is more suitable for plant growth, and it limits the risk of burning or drying out. These lights are small as compared to the traditional lighting options which make them very portable. These lights come in different size options that make them very versatile. Even if you have the smallest plant growth, you will find an LED light suitable for your needs. Choosing the best grow light depends upon your requirements and your budget. If you have a small scale growing operation, then you should opt for a more affordable option and a bulb that is less wasteful. For commercial purposes, you need top quality and a highly durable light that is used in a professional environment. You need to understand that there are different spectrums for different stages of plant growth. 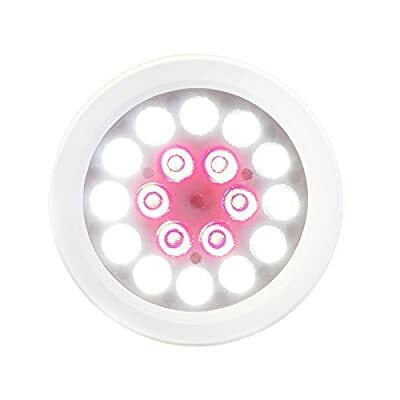 If you are growing a plant from seed to flower, then you will need a full-cycle LED grow light. The blue and red spectrum lights are useful if your plant has already germinated in natural light. You should understand the needs of your plants. Some plant types need high light while others are good with low light as well. Check to see if your plant is sensitive towards bright lights. If they are, then you shouldn’t spend money on lamps that will burn or dry out your plants. Having an indoor growing room will need a good amount of your time and money, therefore; you need to plan your expenses accordingly. There are a variety of points you must consider before you make your purchase decision. You need to consider the type of the plant you are growing, the size of the operation, its cooling requirements, and various other factors. Therefore, you need to think about your light carefully and according to your growing project. There are plenty of options available on the market, but you have to keep an eye on your requirements and budget and spend accordingly. 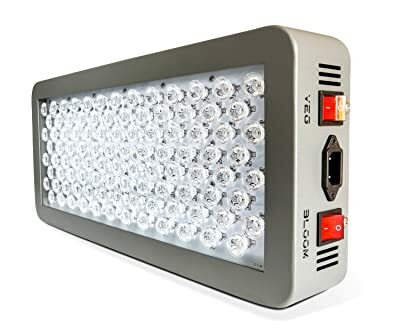 LED grow lights can help in saving energy and cost and these lights are better suited for any project as compared to traditional lighting options. Q: What is an LED grow light and how does it work? It is uniquely suited to plant growth, which is why they are mostly used as an alternative to sunlight for indoor crops. They do this by emitting light of the particular wavelength that is ideal for the growth of the respective plants. They are suspended on top of plantations where the area they cover can be adjusted by adjusting their height. Q: Will Grow Lights really help my crops grow better? Yes. 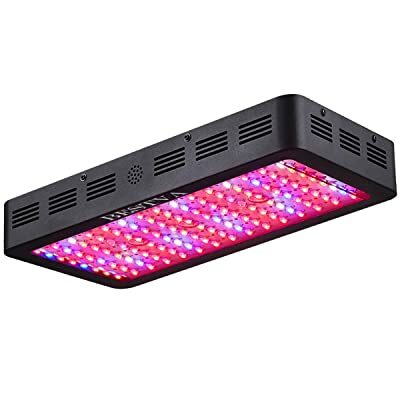 These lights give you much more control by allowing you to choose what spectrum you would like the output to be in based on the crop you are growing as well as the stage of growth it is at. As such they produce what is known as Photosynthetically Active Radiation that is meant to actively stimulate photosynthesis. On the other hand, conventional lighting systems tend to throw generic artificial light on the crop, which is undesirable for plant life. Secondly, unlike other lighting systems, LED grow lights also have low radiant temperatures, and therefore do not interfere with the microclimate that you create for your crop. Q: Are LED grow lights durable? Some studies show that LED lamps to differ from other light sources HID or High-Pressure Sodium lamps, in terms of longevity, by a factor between five and six. To put that into perspective, the average LED lamp last for about 50, 000 hours, while an average HPS lamp lasts for about 10,000; never mind the output losses that occur in HPS lamps over time. To put that in an even clearer perspective, the average LED lamp will not need a replacement for more than six years, and in cases of good maintenance, this number can even go up to eight or nine. Q: Can LED lights damage my crop? No. One of the greatest fears about grow lights is that they might damage crops due to the heat they supposedly produce. For starters, LEDs, in and of themselves, do not get burning-hot like HID systems do. In fact, at full intensity, they are merely warm and can easily be touched. To add to that, almost all LED grow lights on the market these days employ sophisticated heating controls that not only limit their own heat production but also make sure that ambient temperatures are maintained. Measures like using built-in thermal controls and heat sinks are all proven ways of reducing heat emission by LEDs to a practically negligible level. Q: What is Lumen Output and how does it affect the functioning of my LED grow light? The Lumen Output of any LED grow light is basically the measure of light it produces. More often than not, power output and Lumen output are correlated. A high power output will mean a higher lumen output. However, scientifically, Lumen is the measure of the intensity of light that falls on the human eye. In simple words, it is the measure of the amount of light we see and not the amount of light that is being produced. In reality, the parameter that you should be paying more attention to is the aforementioned Photosynthetically Active Radiation or PAR produced by a grow light.